Could Your Oral Health Benefit from a Dental Crown? You do your best to take care of your teeth, but sometimes, things happen, and your tooth becomes damaged. Damaged teeth can lead to serious complications. In many cases a dental crown is placed, which could help to protect your oral health. A dental crown, often made out of ceramic, is essentially a "cap" that covers the entire visible portion of a tooth. It helps to provide strength to a weakened tooth, which allows that tooth to stay in its socket and avoid the need for extraction. Getting a crown is a relatively easy procedure that often takes two visits. During the first visit, your tooth is prepared, or reduced in size, which will allow the final restoration to fit properly into place. Impressions are taken which are sent to a lab to create your custom crown. It is placed with dental cement during your second visit. • Strengthening a weak tooth. • Holding a damaged tooth together. • Covering over a tooth that has a large filling. • Securing a fixed bridge, which is designed to replace missing teeth. 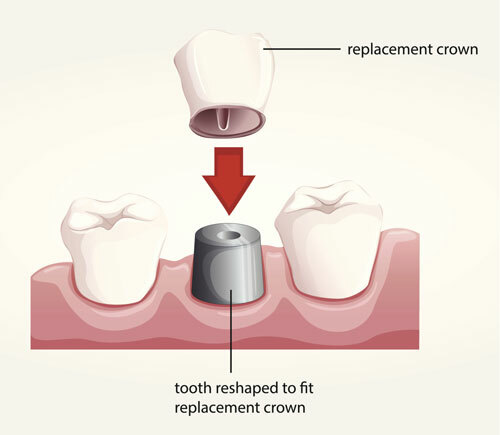 • Replacing a missing tooth by means of a dental implant. • Protecting a vulnerable tooth against plaque buildup and decay. • Protecting a vulnerable tooth against erosion. • Restoring the function of your mouth, which improves your ability to eat. When you are able to properly chew your food, you are better able to digest it. This improves your overall nutrition, which keeps your mouth healthy. • When anchoring a bridge in place, it fills in an empty gap, helping to hold your natural teeth in place. This prevents your teeth from shifting, which could otherwise lead to wear on your teeth and jaw pain. Crowns protect and strengthen damaged, vulnerable teeth. If your tooth has suffered damage, be sure to contact your dentist right away.